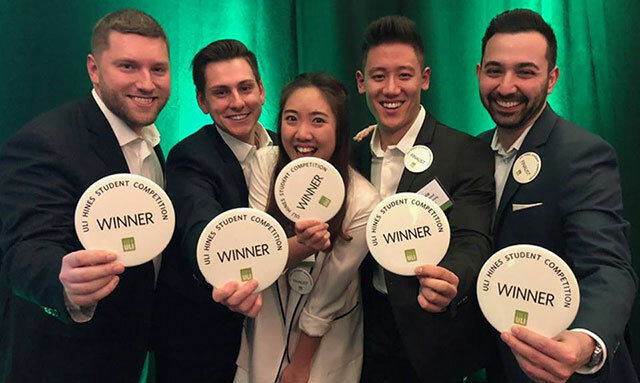 Students in the Cornell Baker Program in Real Estate carry their passion for real estate into student groups, community engagement, and case competitions across the country. The small, collaborative cohort of the Baker Program is one piece of the larger Cornell real estate community. Comprising undergraduate and graduate students in real estate minors and related fields, the Cornell real estate community on campus includes more than 500 people with a shared passion for the industry. This group interacts in shared courses; through the Center for Real Estate and Finance programs; via student groups; at career fairs, speaker events, and workshops; and through the Cornell Real Estate Council. Expanding your real estate network among Cornell peers brings long-term benefits throughout your career. Baker Program students are regular and successful participants in master’s-degree case competitions across the country, including those listed below. Congratulations to our Baker students for their success at the following competitions this year! ULI Hines Student Competition: An urban design and development challenge for graduate students that engages multidisciplinary student teams to devise a comprehensive development program for a real, large-scale site. ARGUS University Challenge: Students create real-world investment strategies through informed decisions using ARGUS solutions. Students compete for cash prizes totaling $14,000. The Impact Investing in Commercial Real Estate Competition: The case competition tasks teams with identifying projects with the intention to generate measurable, beneficial, social or environmental impact alongside an appropriate financial return and presenting a plan to bring them to fruition. Kellogg Real Estate Conference and Venture Competition: The primary purpose of the competition is to encourage entrepreneurial real estate ventures. The event also serves as an opportunity to promote top student talent before prominent industry professionals. The CASE Competition: Teams of no more than four graduate students have six days to submit a development proposal that includes a brief concept narrative, a bid price and development program for the site, a description of the capital structure for the development venture, a fully functional Excel-based financial model, and a summary PowerPoint presentation. ALTUS Group Real Confidence University Challenge: An investment competition comprising 47 universities and colleges with over 290 students competing to win up to $50,000 for their institution by producing the top-performing portfolio for the year. University of Texas at Austin McCombs School of Business National Real Estate Competition: Graduate student teams compete for the highest honors and cash awards in an invitation-only real estate case competition. The top four finalist teams receive a $25,000 cash prize. UNC Real Estate Development Challenge: Teams present their case solutions in a 20-minute presentation, followed by five minutes of questions from judges who are experts in the real estate industry. Top finalist teams can win $20,000 in cash prizes. Developers’ Den: Canada’ longest-running and most prestigious real estate case competition, Developers’ Den, the Schulich international real estate case competition, is presented by Schulich’s Brookfield Centre in Real Estate and Infrastructure and the Schulich Real Property Alumni Association. Students from top schools will take part in an intense two-part case competition where the best and brightest real estate students will showcase their skills before a panel of judges composed of industry leaders, investors, and executives. Meet members of the Baker Program in Real Estate Classes of 2018 and 2019 (PDF, 10.5 MB). Cornell AREC provides its members with access to real estate-centric events, career services, and workshops that enhance their professional development and broaden their industry knowledge. It also serves as a networking organization among real estate-focused graduate students across the Cornell community. This new group is currently being organized. The Cornell Real Estate Review is the only entirely student-managed scholarly real estate journal in the country. The editorial board consists of a second-year executive editor and three to four assistant editors, selected by the outgoing editorial board and the Baker Program director. Students are encouraged to submit articles, reviews, and collateral materials for web or print publication. Opportunities exist for current students to collaborate with a professor or practicing professional to write an article for submission; in addition, articles may be submitted for one of two annual prizes awarded at the decision of a review committee. Cornell Real Estate Women is Cornell’s primary graduate and professional student organization dedicated to the promotion and advancement of women in real estate. Cornell Real Estate Women provides networking and mentorship opportunities with female industry leaders in order to build connections between future and current professional real estate women. By attracting more female real estate executives to come to Cornell, especially to speak at the Baker Program’s Distinguished Speaker Series, Cornell Real Estate Women hopes to prepare members for their future professional settings, to ensure that all members are comfortable in the industry and in their work environment. Design Connect is a student-run community-design organization that offers practical experience to students through partnering with local municipalities and nonprofit organizations that may not have the resources to hire professionals.